These boutique style dresses are perfect for your little girl's Back to School and summer wardrobe. 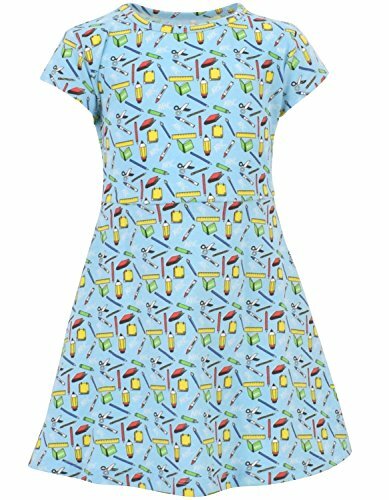 The dress features an adorable multi colored school supplies theme with pencils, pens, crayons, rulers, scissors, books and letters found in the print. The dress also has 2 pockets cause kids love pockets! Made of a 95% high quality soft cotton and 5% stretchy spandex blend, this outfit is super soft and comfortable. WHAT KIDS LOVE: Comfort and School! Your little girl will love the adorable school supplies print and the soft Egyptian cotton will make this dress her favorite! STYLE [BACK TO SCHOOL]: Make sure your little girl stays cool and comfortable at school this year in this adorable dress. The school supplies print makes this dress extra fun!